About Untensils and Coverings .. Elimination, Auto Start and Help. There is a choice of English, Spanish or French and a choice of U.S. Customary Unitpound or Metric-kilograms. Touch CUSTOM HELP and follow the directions displayed or check page 24.
misuse, abnormal service or handling, or which has been altered or modified in design Of construction. R-1850A, R-1851A and R-1852A Home Use Carousel Microwave Oven. vided free of charge for this additional period. Authorized Servicer, call Sharp toll free at 1-800-BE-SHARP (1-800-237-4277). oven. Save proof of purchase as it is needed should your oven ever require warranty service. 9. This appliance should be serviced only by qualified service personnel. 15. See door surface cleaning instructions on page 26.
openings, hood (louver) or grease filters. or burners. The fan, if operating, may spread the flame. This appliance is suitable for use above both gas and electric cooking equipment 36" wide or less. 2. the feature sticker, if there is one, from the outside of the door. 1. Charcoal Fitter Kit (RK-220). This is required when hood exhaust is recirculated. See Charcoal Fitter Krt on page 27. If your dealer does not stock this item, rt can be ordered by calling 1-800-BE-SHARP. use of the grounding plug can result in a risk of electric shock. 1. If you have any questions about the grounding or electrical instructions, consult a qualified electrician or serviceperson. carefully and always save for reference. mix or the broil settings are used. ones. Ventilation openings must not be blocked. in the oven. The turntable will turn both clockwise and counterclockwise. See page 10 for turntable on/off instructions. to dry clothes or newspapers. using the IEC-705-1988 method. In using recipes or package directions, check food a minute or two before the minimum time and add time accordingly. hear the magnetron cycling on and off . items like roasts must be turned over at least once. not just at edge . .. Center bottom of dish is very hot to the touch. , Poultry thigh joints move easily. • Meat and poultry show no pinkness. , Fish is opaque and flakes easily with a fork . 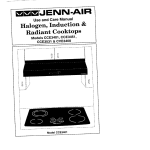 microwave convection oven. The chart below will help you decide what utensils and coverings should be used in each mode. DO NOT use metal twist ties. use. DO NOT allow plastic wrap to touch food. Good covering for cooking and reheating. DISH CHECK. If you wish to check if adish is safe lor microwaving, place the empty dish in the oven and microwave on HIGH for 30 seconds. If the dish beccmes very hot, DO NOT use it for microwaving. There are many microwave accessories available for purchase. Evaluate carefully before you purchase so that they meet your needs. have been cooked to safe temperatures. Sharp is not responsible for any damage to the oven when accessories are used. 11. Time display: Digital display, gg minutes gg seconds. 8. FAN HI/ LO button. The turntable will rotate clockwise or counterclockwise. Number indicates pages on which there are a feature description and usage information. Before the oven can be used follow these procedures. turntable so that it is level. casserole tor 45 minutes on 40% power. 3) Touch CLOCK and follow directions to set. pad and re-enter the time. select auto cooking except Sensor Reheat and CompuBake. door and touch STARTrrOUCH ON. whether the turntable is off or on. [LOCK I atterthe power is reinstated. If this occurs during cooking, the program will be erased. The time of day will also be erased. Simply touch STOP! CLEAR pad and resetthe clock forthe correct time of day. in a 13"x g"x 2"
which can be used whether the door is open or closed. the Hood Light off, touch the LIGHT pad again. twice and touch the pad three times to turn the fan off. Alter the 1st stage, open the door. Suppose you want to defrost a 2.0 pound steak. Touch COMPU DEFROST pad once. two more times to select steak. power. See Manual Defrost on page 13. Remove any thawed pieces alter each stage. • Number of touches AFTER initial touch to access COMPU DEFROST. aluminum toil to cover edges and thinner sections of the food. and the oven will shut off. Less Time Adjustment. See page 23. "Amount" column on the chart, you need to defrost manually. charts should be cooked by time and variable power. increments on power level 3 until totally defrosted. vapor (moisture and humidity) em itted from the food as it heats. Plastic wrap should not touch food. 1. Room temperature should not exceed 95° F.
STOP/CLEAR pad and select cooking time and power. of cooking time will appear. opened when remaining cooking time appears on display. At this time, you may stir or season food, as desired. 5, Check food fordoneness after cooking with sensor settings. • Suppose you want to pop a 3.5 oz. bag of popcorn. setting can be programmed with MorelLess Time Adjustment. and place in oven according to directions. will indicate turntable off and oven will start automatically. After cooking .1 LET II 5TRrtD II [DI/fRED ! will be displayed. plastic wrap or lids with larger quantities of more dense foods such as stews. to stand, covered, 2 to 3 minutes. Time Adjustment can be used to provide adjustment needed for older popcorn or individual tastes. from oven, wrap in aluminum foil and let stand 5 t01 0 minutes. most brands. You may wish to try several and choose your favorite. fer covering. After cooking, let stand, covered, for 1 to 3 minutes. Place bacon on paper plate, lined with papertowel. Bacon should not! ex1end over the rim of plate. Cover with paper towel. underneath). Cover with plastic wrap. After cooking, let stand, covered, 3 minutes. for convection and combination cooking. and it should never be restricted so that it cannot rotate. and when preparing food to be cooked directly on the turntable. minutes at 375 F., convection. enter same temperature in steps 2 and 3.
minutes and then the display will change to time of day. displayed and cooking mode and time can be entered. you want to cook at 350'F. for 25 minutes. and Er:J will be displayed. or change it to a different temperature. easy to cook with both convection heat and microwave automatically. 25 minutes on 325°F. Low Mix bake. With the exception of those foods that cook best by convection heating alone, most foods are well suited to mix cooking using either LOW MIX/BAKE or HIGH MIX/ROAST. w~h just the right amount of browning and crispness. The oven temperature can be changed from 1DO°F. to 450°F. and [ Er:J I will be displayed. you want to roast a 2.5 pound chicken. minutes. Internal temperature of white meat should be 170'F. and of dark meat, 180'F. white meat should be 170'F. Boneless pork loin is recommended because ~ cooks evenly. white meat should be 170"F. and of dark meat, 180'F. cake pan inside. Close door and touch START! No preheat is required for the French fries baking procedure. Place French fries on cookie sheet on low rack. enter less time before touching START pad. "Suppose you want to broil 2 hamburgers. Aher brOil prehe,t cvcle eids, 41~ng toles will sound. Use this setting to broil hamburger patties. Place on low rack. Arrange pieces on low rack. Aher cooking. let stand, 3-5 minutes. Dark meat should be 180'F., and white meat should be 170'F. one setting to another automatically. and then continue to cook tor 30 minutes at 50%. number ( Ex: 50% ). cooking. closing the door, touching the STOP! me~ing cheese, bringing milk to just below boiling etc. • Suppose you want to melt cheese on a piece of toast. after touching your choice of pads. • Suppose you want to heat a cup of Soup for one minute. microwave, convection, mix or broil. number ( Ex: 90% ). features can now be demonstrated with no power in the oven. To cancel, touch CLOCK. the [email protected]] and STOP!CLEAR. 1. Auto start can be used for manual cooking, Compu Broil! Hood Fan and Hood Light buttons. showing the correct time of day. change, touch CU~TOM HELP and the number ~. HELP, the number [II and STARTffOUCH ON. number ~ until your choice is selected from the table below. Then, touch STARTfTOUCH ON pad. lighted in the interactive display. Operata the oven for two minutes a HIGH 100%. A. Does the light ceme on in the oven? pad is touched and TURNTABLE ON is in the display? microwave oven should never be serviced by a "do -lt-yeurself" repair person. Mode on page 24 and cancel. - Complies with Department of Health and Human Services (DHHS) rule, CFR, Title 21, Chapter I, Subchapter J.
and coeking mode and time can be entered. and then the display will change to the time of day. Charts on pages 19, 20 and 21. 2. Select desired Compu setting. (Ex: Touch [j] for chicken). See CompuDefrost Chart on 12. COOK setting. (Ex: 1 ). and oven will stop instantly.